"I’m just an ordinary person with a purpose, who’s crazy enough to try do something heroic about the water crisis"
This is going to sound crazy, but on 22 March I will begin a journey of over two million steps for water. I’m not an athlete, and 25 years ago I broke my back and was told I’d never run again. But I am doing this. And you could too. All you need is a big enough purpose. If you’ve read the World Economic Forum's Global Risk Report you’ll know the water crisis is one of the world’s top 10 biggest risks. We can’t live without water. Yet in cities where water is available on tap, few people know that the world could run out of water in our lifetime. Clean, safe, accessible water for all is the most pressing issue our world faces today. It is the United Nation’s Sustainable Development Goal 6 (SDG6) - “Ensure availability and sustainable management of water and sanitation for all”. Water scarcity, poor water quality and inadequate sanitation affect people’s livelihoods, food security, choices and their future. It affects the job market, our economies, as well as our common safety and stability. But most of us take water for granted. Most of the water we use is indirect or ‘invisible’. It is consumed in the making of products and utilities — the t-shirts we buy, the fuel we use, the coffee we drink, the cars we drive, and the meat we eat. Almost everything we use and consume every day is made using water. Paper and plastic, for instance, requires a lot of water to make. When we don’t recycle plastic or paper, we’re literally throwing water down the drain. Water is the reason I’m running 1,049 miles (1,688 kilometers). We have to focus the world’s attention on the need to contain our water usage. People have called #Run4Water — which starts on World Water Day — “crazy”. I don’t entirely disagree. But how else do you focus an information-saturated world’s attention on the global water crisis? To do something meaningful about the world’s water challenges, we need millions of people to realise just how much water they’re using every day, and we need people to change. But changing human behaviour is hard — something you’ll appreciate if you’ve ever tried to kick a bad habit. I’m running 40 marathons in 40 days, along 6 rivers, on 6 continents, because if we don’t shift things, by 2030 the demand for water will outstrip supply by 40%. What can go wrong as I run alongside the Colorado River, the Amazon River, the Murray River, the Yangtze River, the Nile River and the River Thames? Weather is one thing. I’m expecting thunderstorms in Sao Paulo and incredible humidity in Shanghai. But there’ll also be arid areas. The big challenge en route is to stay hydrated, keep eating, and avoid getting hurt. I dread falling, cuts, cramps, blisters, bites, hyperthermia or stings. I’ll run about seven hours a day. I hope to rest well. Sleeping is everything when you’re running a marathon a day. That’s the physical. But what’s happening in my mind is the bigger deal. During the two-million or more steps, what will occupy my thoughts? At times you can go to the darkest, most awful places in your mind when you run very far. This is when I consciously try to think of what inspires me — the innovators finding solutions to the water crisis. I think of people like Mikkel Vestergaard Frandsen, who reinvented his family-owned textile business 20 years ago, and helped make the world a better place. Frandsen knew he couldn’t live a happy life making linings for uniforms — what the company did in the old days. Over time Frandsen used everything his company knew about textiles to solve major human problems. But change didn’t come easy. In the 1990s, the Carter Center asked the textile specialists to develop a filter that could remove Guinea worm larvae from water. This led to the creation of a hollow fiber membrane, or filter. This breakthrough innovation led to LifeStraw . Today LifeStraw delivers water purifying solutions to adventurers, but also plays a major development role in countries like Kenya. If you ask Frandsen if doing good is good for your bottom line he’ll, no doubt, offer an emphatic yes. Becoming a business for good increased revenues of his family business fifty-fold. Survival tools, like those made by LifeStraw, are handy when all that’s available to you is contaminated water. 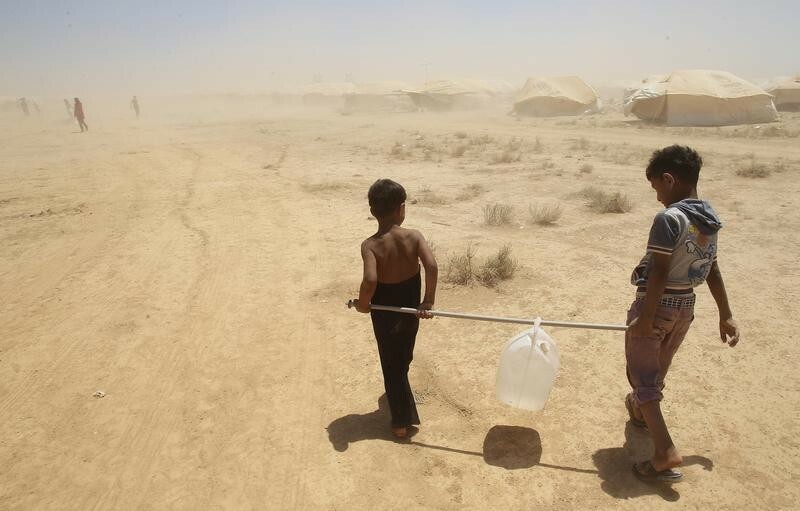 Syrian refugees boys carry water for their family at Al Zaatri refugee camp in the Jordanian city of Mafraq, near the border with Syria, August 12, 2012. Thankfully, water innovators are everywhere. Did you know that the man who invented the Segway, Dean Kamen, developed a machine that can run on cow dung and purify 264 gallons (100 liters) of water a day? It is called Slingshot and it is backed by the Coca-Cola Company. To combat water wastage when dyeing textiles, DyeCoo has developed a zero-water dyeing system. Highly pressurized CO₂ replaces water and chemicals in a system that is cheaper and more efficient, which means that a brand like Nike, which harnesses this tech, can reduce its water footprint. In Israel, meanwhile, a technology startup called Utilis has innovated a breakthrough system that could help the US stem some of the one trillion gallons of water it hemorrhages annually. Utilis analyses satellite imagery to identify leaks in underground water systems to ensure fresh water isn’t squandered. These are pioneers in the field of water conservation and purification. Now imagine how innovation could solve corruption and mismanagement in government water systems. Or what could be done to pioneer a change in the fashion industry that burns through water at a scary rate. Or how we could meaningfully impact agriculture, which uses close on 70% of our water resources. What LifeStraw, Nike, DyeCoo, Slingshot and Utilis show us is that we can’t only rely on governments to solve the global water crisis. It is up to business and social entrepreneurs, innovators, people like you and me, to make a difference. We know that in 13 years there will be a 40% shortfall in the world’s water. But sadly most political leaders are complacent about the urgency of the crisis, so we need to mobilize mass public opinion and involvement to avert disaster. I’m just an ordinary person with a purpose, who’s crazy enough to try do something heroic about the water crisis. I want to ensure that by 2030 we’ll all have safe, affordable drinking water. That access to sanitation will be equitable. That we’ll reduce pollution and eliminate toxic dumping into our water resources and systems. And that we demand responsible usage of water in agriculture and business. That Goal 6 of the United Nations Sustainable Development Goals will be realised. I’m hoping that after reading about this epic quest I’m on, you’ll join me and become a water hero too. How do you do this? First off, ensure that you and everyone in your household are educated about the water crisis, and know your water footprint. But the greatest task is to ensure business commits to sustainable water management. Part of this means companies must measure and disclose their water footprint. And, if you own or run a business, commit to the CEO Water Mandate. Finally, if you have influence in government please take the water crisis seriously by integrating SDG6 into your policy framework. Follow Mina Guli’s #Run4Water quest on Twitter, Instagram and Facebook.